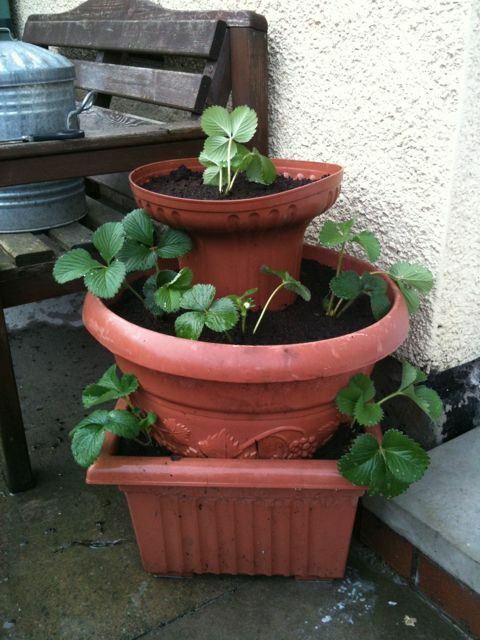 Had a few pots lying around which fit nicely inside each other, so I decided to make a bit of a ‘strawberry tower’ to sit against the South-facing wall just outside the back door. I do have strawberry plants in the middle sector of the garden, but they are not in the sunniest of locations and tend to get a bit shaded out by the blackcurrants and apple tree and other stuff. They also get eaten by slugs, so I have decided to use any strawberries from the garden in my autumn wine making, and to have the ones in this new tower for eating. I bought half a dozen plants, each one a different variety, in order to give a cascade of different tastes, shades and ripening times.